Students gather in front of the FVPD. Photo courtesy of John Le. Fountain Valley High School student representatives Cody Do, Lexie Geltman and Tiffany Nguyen led an event in the bowl during break today in conjunction with National Student Walkout Day. Word of the event quickly spread through Facebook posts, Instagram and Snapchat stories. Participants were invited to meet in the school bowl area at 10 a.m. while Do advocated for change. As he listed the names of the 17 lives lost at Stoneman Douglas High School, students stood in a moment of silence. Moments later, students began to chant across the bowl. During the open forum portion of the event, junior Mindy Nguyen took the stage and challenged students to walk out of school grounds. “We have the right to walk out. Why are we just sitting here? If you want to make change, walk out that school. You think it’s safer to sit here in a single place and do nothing. What are we doing here, sitting here? We could walk out, we have our rights,” said Nguyen. Approximately 200 to 400 students rallied behind Nguyen and marched down Bushard St. towards city hall. Officers from the Fountain Valley Police Department, Principal Dr. Morgan Smith, HBUHSD district officials and supervision accompanied the students as they marched. “As a student, I feel that it’s my purpose to stand here alongside our fallen brothers and sisters and I feel like since we are the youth, we need to show our power and our voice in today’s society,” said junior Michelle Cone. 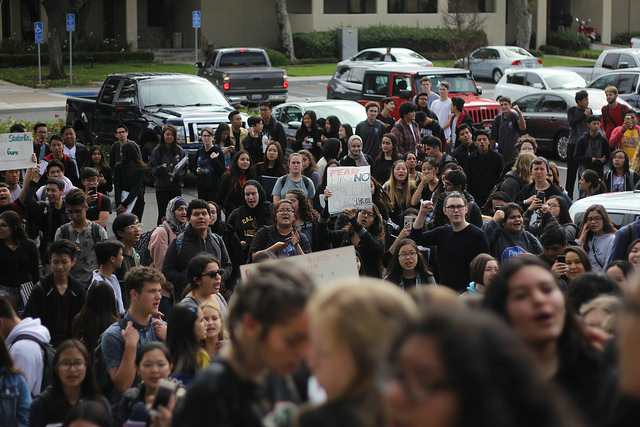 It was announced that after school on March 30, FVHS would hold a open discussion after school in the bowl to discuss student safety and the next steps in gun control legislation.